The following information comes from a book written by Lucy Horton containing information about the Orlando Hughes Family of Wales. There seem to be various similarities to both known facts as well as undocumented family stories about the Yancey family. 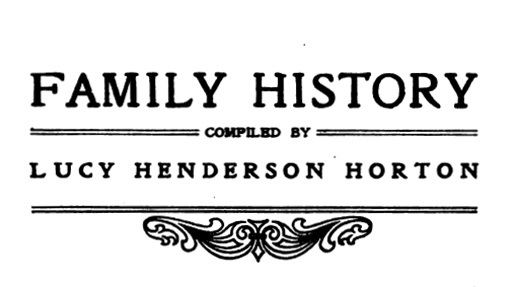 Even some of the rather unusual names in the Yancey family are replicated here in the Hughes family. 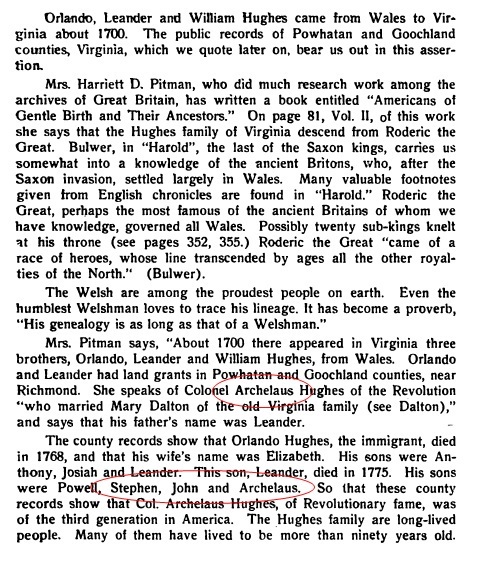 Also note in this same book is indeed information about the Yancey family also - family connected to the famous brothers William Lowndes & Benjamin C Yancey page 82 - This Yancey info I was already aware of - - and it would seem its placement here is just coincidence - (even if there were some sort of connection between the first Yanceys and these early Hughes). 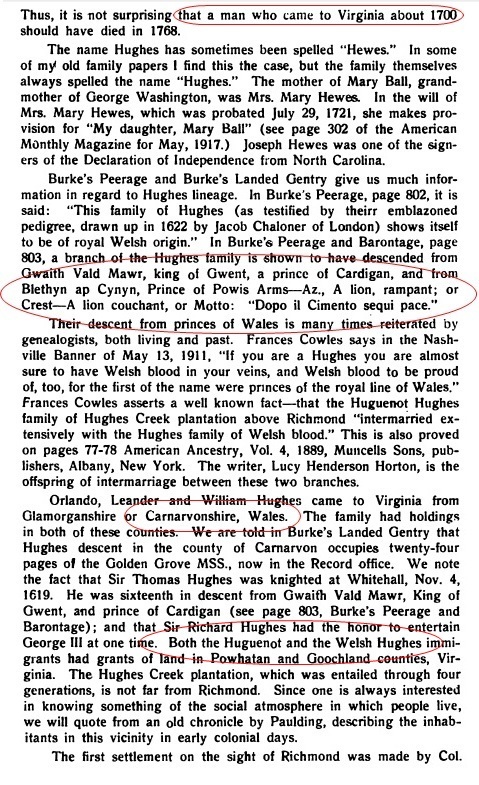 In other words - I have no reason to believe the author (or any family researcher) knew or even suspected any close connection between the early Hughes and the early Yanceys. Though there was some very distant connection across various marriages and generations - and thus the inclusion in the book by the author of the Yancey info. another interesting citation recorded here. I was born on the 22nd day of February 1800 in the county of Henry and state of Virginia on the East Fork of Leatherwood Creek. 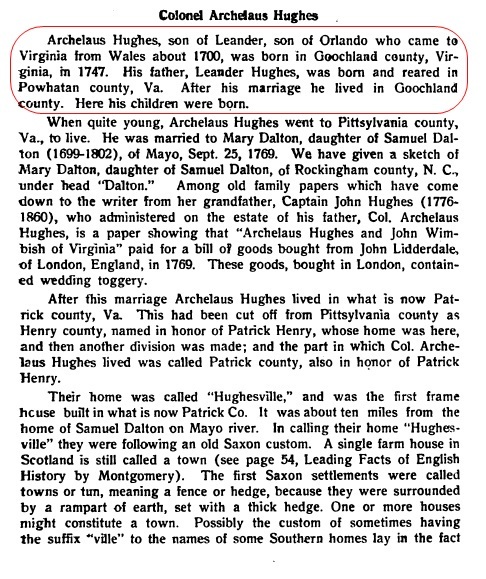 My father was a son of Colonel Archelous Hughs of Henry County, Virginia, once Patrick County. My father was a member of the Virginia Legislature for the county of Patrick in 1799. That fall he left Patrick and moved to Henry were he lived till the fall of 1814, when he moved to this state, lived one year in Smith county where I learned the English grammar. He then moved to Williamson County on Big Harpeth 14 miles above Franklin were he now lives. My mother was the daughter of General Joseph Martin of the County of Henry, state of Virginia. He was a captain in Virginia Line in the Revolutionary War. He was agent to the Cherokee Nation of Indians. He commanded the American forces at the battle of Lookout Mountain against the Cherokee Indians. He liked to have been defeated, had a number of his men killed. Represented Sullivan County on the Legislature of North Carolina before this was a state. He was one of the commissioners on the part of United States that treated with the Cherokee Nation of Indians at Hopewell on the Rowie, which was in 1785. He was with others a commissioner on the part of Georgia in the year 1784 to ascertain the quantity, quality, and circumstances of the land in this tract of country called the Big Bend of Tennessee which was then in the chartered limits of that state and to grant warrants of survey. For further evidence on this subject please see the Resolutions of the Georgia Legislature of the 20th of February 1784 and the proceedings of Conegress upon the claims of Mounsey (?sp), Carr, Andrew Jackson, and others accompanied with a Bill for the benefit of Thomas Carr and others December 14, 1819. He was one of the Commissioners on the part of Virginia to settle the boundary line between this state and Virginia. He was for many years a member of the Virginia Legislature from Henry County, and would only lose from three to ten votes in the county. He was at the time he died a Brigadier general of the militia for the Brigade in which he lived. He retained his popularity till his death. He was twice niarried. He had by his first wife, who was Sally Lucas, two sons, William and Brice, and five daughters by his first wife. His second wife was Susan Graves by which he had eight sons and three daughters. His oldest son, William Martin, was a member of the Georgia Legislature for some years, one of the first settlers of Smith County in this state, represented it in Legislature. Was Colonel of the Militia of Georgia and also Colonel in the Creek War of 1813. He commanded as such at the Battle of Talledega, ect. Elector of President and Vice-President several times from the district in which he lives, A commissioner on the part of this State for the adjudications of land warranty in 1819-1820 counties in which they lived. The other one, Major Britt Stovall was surveyor of the County of Patrick, which office he holds now. Major John Fulkerson, who married Jane Hughes, second sister, for many years represented Lee councy in the Legislature. Colonel Joseph Martin, my mother's brother, married the third sister of my father, Sally Hughes. Brig. Gen. John Dillard of Henry County, Virginia, married my father's youngest sister, Matilda Hughes. He was a member to the Legislature of Virginia from that county during the late war, and sometime after commanded a volunteer artillery Company at Crany Island near Norfolk for six months during the late war, since which time he has been Colonel of the County of Henry and was about two years since elected by the Legislature of Virginia, Brigadier General of the Brigade in which he lives. Rubin Hughes, another of my father's brothers, was for a long time Postmaster at Hughesville in Patrick County. Gabriel Hughes, the other brother, and Mary Hughes, the other sister, died when quite young. Grandfather Hughes died in his 52nd year. Grandmother Hughes is still living and in good health. She is in her 73rd year and looks as if she might live to be one hundred years old. The Daltons are a long-lifed people. Her father lived to the age of one hundred and fifteen years, and my great grandfather Lucas, my grandmothers father on my mothers side, lived to the age of one hundred or upward. General William Martin of Williamson County in this state is a near relation on both my father's and mother's side. His father being brother to my mother's father, and his mother being sister to my father's mother. He was through the whole of the last war. He was a Major one campaign in the Creek War, Captain once, and was nearly in all the battles fought in the nation. His company was in front of the main army in the Battle of Talledega. It was his company, and not Capt. Hammond that fought up the dry branch at Talledega, as stated in the official report of Gen. Jackson. He commanded a volunteer company at New Orleans. He was in the Battle Of the 23rd of December at night, and on the 8th of January in the morning. He acted a very brave and distinguished part in both of these engagements. He commanded as Major in the Seminole campaign, was at the taking of St. Mark's, Pensacola and Barruica. He commanded a detachment of men to bring up the cannon from rear the fort. He was always found at this post ready to do his duty and to brave danger. In any shape, when it became necessary he had the esteem of his superior officers and the love and good will of his inferior officers and his soldiers. He has been elected to the Legislature from Williamson County whenever he offered with ease, never with less than 1431 votes, always beating his opponents without any difficulty. The first time he was elected was in 1817. Col. George Weatherspoon was his opponent. He was elected by a majority of 1101 votes over him. After that he never had opposition till at the last election August 1825. There were two members to be elected and five candidates. The county voted about 2200 strong. He rec'd. 1545 votes, a majority of 518 over the next highest. In the year 1821 Major A. Maury, one of the most popular men in the county, Martin beat him 1931 votes. In 1822 he was elected by the Legislature of this State Surveyor General of the 7th Surveyor District. In the room of Gen. Sam H. Williams Brook for corruption in office he did not keep that appointment long, but resigned and returned to Williamson County again to live in the summer of 1823. The office of Brig. Gen. became vacant by the resignation of Gen. B. Coleman who was moving to the western district. Martin became a candidate for that office. His opponent was Col. Joel Parrish, Cashier of the Bank of the State of Tennessee at Nashville. The result was that Martin was elected, notwithstanding all the influence of the talents of Nashville, backed by the power of money and the Bank of the people. He was appointed by the General Assembly of this state as one of the commissioners to fix upon and establish two seats of justice in the ten new counties of the Western District lately organized. He has given general satisfaction to the people in the various appointments he has filled, and if I may use the expression, he how swims in the affection of the people. He is an old bachelor, about 45 years of age. Humane and benevolent, his heart abounds in charty. He belongs to the Masonic order. He commanded the troops at Nashvlle when Lafayette was there. The reason I am so particular in detailing the character of this man is he was the companion and friend of my early youth. He has been my bosom friend since manhood. Kentucky and of Maryland are of the original stock. The W. Hughes that is Charge d' affairs to the Court of Sweden is a relation. 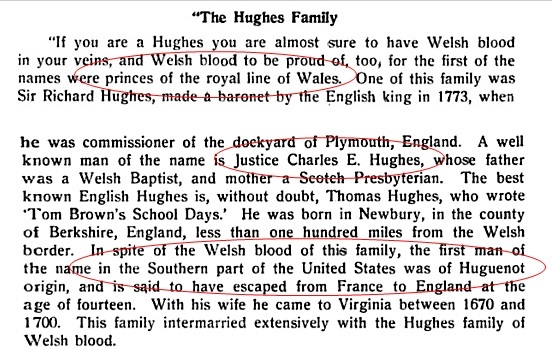 The Hughes family is of Welsh descent. Three brothers of them came over to America and settled in Virginia and Maryland about 150 years ago. Their names were Archelaus, Leander and Orlando. The branch to which I belong sprang from that of Leander. The name of Archelaus is one peculiar to our family. It is the most common name in the family. Governor Rutledge of South Carolina, one of the signers of the Declaration of Independence, is a relation. Littleberry Hughes of this state for some years in the legislature and at this time a senator form Smith County, is an own cousin to my father. My grandfather Martin's sisters married into the families of the Wallers of Spottsylavania.Virginia, the Edwards of Albermarle, Virginia, and the Isbells of North Carolina. The sisters of my grandmother Martin married Farney Fargason and Brice Martin, a brother to my grandfather. He was also one of the pioneers of the West. He braved with my grandfather the trails and dangers in guarding the frontier of the settlement of what is now called East Tenessee. It sprung out of this issue from my great grandfather and mother's progeny. They would form a small republilc of themselves, the most of them stern and unbending Democrats, rarely an exception. I knew of but one solitary exception. He is no more. He was a great uncle on the father's side. Many of these relations have filled high and dignified appointments in the various sections of the country in which they lived. It is a trait in the character of my immediate family relations, and I am told in all the rest, to love to dip into politics, to take warm and active part in all elections by the people, and it's very seldom they are every beat. They are equally ready to shoulder their knapsack and musket and march to the bloody field when the token of war is sounded, and when an enemy is hovering on out coast, or yell of the savage is heard on the frontier. Sister Sally married in the 16th year Stephen Nance of Henry County, Varginia. He was Lieutenant in the Artillery Company commanded by Capt Dillard at Crany Island. He now lives near Paris in Henry County, this state. Brother Joseph is carrying the trade of a house-joiner. The balance of the childre with the exception of myself are now living with my father.